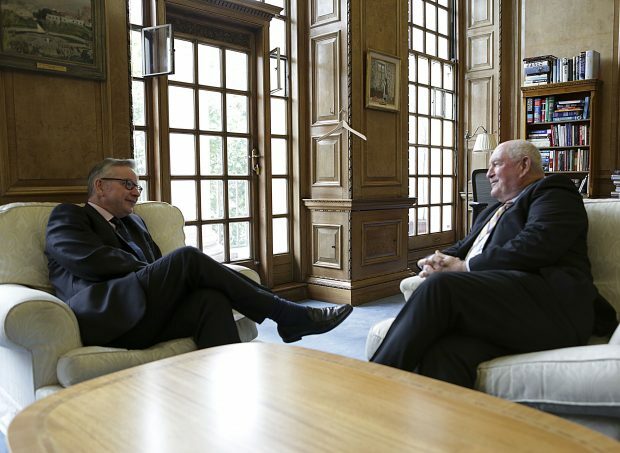 Today, Environment Secretary Michael Gove met US Secretary of Agriculture Sonny Perdue to build on the UK’s close and constructive relationship with the US. In the meeting, they spoke about the importance of maintaining our high animal welfare standards in any future trade deal. As two of the world’s leading agricultural nations, the UK and US have a close and constructive relationship built on thriving trade and shared expertise. We already ship more than £2.1 billion of our food and drink to the US each year and are committed to driving this further. I was pleased to meet my US counterpart today to emphasise our shared goal of building trade relationships while maintaining our high animal welfare standards and I look forward to working together in the future. Today, Friday 13 October, we reported that a recent outbreak of Asian hornets had been successfully contained by bee inspectors who tracked down and destroyed their nest in Devon. The hornets were discovered in the Woolacombe area in September, but the National Bee Unit moved swiftly to find the nest and remove it. Asian hornets pose no greater risk to human health than a bee, though they are a threat to honey bee colonies. The hornet prey on honeybees, disrupting the ecological role which they provide and damaging commercial beekeeping activities. This is why we took quick action to identify and destroy their nests. So far, no further live Asian hornets have been seen in the area since the nest was treated with pesticide and removed in earlier this month. Asian Hornets in the UK were covered in the media this week by BBC Online and The Times. This week, the BBC’s Victoria Derbyshire programme covered our plans to tighten licensing requirements for owners of ‘mobile zoos’. Defra will be updating the existing legislation in England on registering performing animals (except wild animals in circuses and static zoos, which are covered by different legislation) to clarify that it includes all animals exhibited to the public. The changes were consulted upon last year and will come into force next year. Under the changes, anyone in the business of providing an animal for exhibit will need a licence from their local authority and will need to adhere to statutory minimum welfare standards, which we are developing with the sector and animal welfare charities. The plans were announced earlier this year as part of our animal licensing review, which also includes new plans to crack down on backstreet puppy breeders. Victoria Derbyshire covered the story following a consultation to bring in a similar licensing scheme in Wales. Animal welfare and licensing schemes, for example for travelling circuses, are devolved policy areas. On Monday, Chief Plant Health Officer Nicola Spence was on BBC Radio 4 highlighting the Government’s dedicated work to protect our trees and plants. This work is vital because our crop and forestry sectors add an estimated £5billion per year to the economy and our healthy forests provide at least £1.8billion in associated social and environmental benefits each year. The package was recorded in the fantastic and well-trodden Hazel and Thoroughsale Woods right in the centre of Corby, Northamptonshire, and also included an interview with a senior forestry consultant for Lockhart Garrat who highlighted the importance of reporting any concerns about new tree diseases. You can follow Nicola Spence on Twitter at @plantchief.